Callesto: A collection of furniture in a timeless style that gives you a lot of décor options! 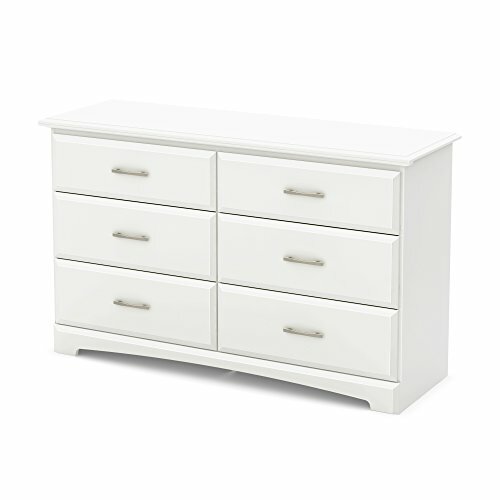 Whether your kid wants a room with lots of color or a more classic look, this dresser will blend with the ambiance while adding some handy storage space. You’ll be happy with this piece for years to come! Metal handles in a Dull Nickel finish. Profiled drawer fronts. Metal drawer slides, for smooth gliding. Drawer dimensions #1: 22.625'' (L) x 13.625'' (D) x 4.375'' (H). Meets or exceeds all North American safety standards. Accessories not included. Requires complete assembly by 2 adults (tools not included). 52'' (W) x 19.375'' (D) x 31.125'' (H). Box dimensions: 59.528'' (L) x 20.118'' (W) x 6.3'' (H), 123 lb. Ships in a heavy box, make sure to have a friend with you. Packaging tested and certified to reduce the risk of damage during shipment. Made in North America with non-toxic laminated particleboard. 5-year quality guarantee. Any questions? Contact South Shore, the manufacturer, available 7/7 by phone, email or chat.